Maximillian Kolbe, Apostle of Mary | Fr. John A. Hardon S.J. 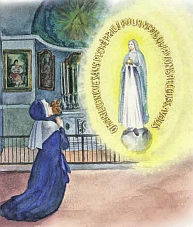 Traditionally, in some places, the feast of Our Lady of the Miraculous Medal is celebrated today. It is the day that Our Lady appeared to St. Catherine Laboure and showed her the images of the medal she wished to have made. Also, historically today is the feast of St. Maximinus, also called Maximus, who lived in the 4th century was abbot of Lerins, in succession to St. Honoratus. In the year 1830, Our Lady appeared to St. Catherine Laboure, a Daughter of Charity in Paris, and told her that God had a mission for her. Standing upon a globe, the Virgin Mary held a golden ball which she seemed to offer to God, and on her fingers were rings with gems that emitted rays of light. She told St. Catherine, "These rays symbolize the graces I shed upon those who ask for them. The gems from which rays do not fall are the graces for which souls forget to ask." Afterward, the ball, symbolizing the world and each person, disappeared, and she held her hands outstretched in the manner of a loving mother, while rays of light continued to cascade upon the globe at her feet as she stood atop the serpent's head. Framing the image in an oval were the words, "O Mary, conceived without sin, pray for us who have recourse to thee." St. Catherine then saw an image of an M upon which was a cross. Underneath the M was Our Lord's heart crowned with thorns and Our Lady's heart pierced by a sword. Surrounding this image were 12 stars. The Blessed Virgin instructed St. Catherine to have a medal made of these images, and she promised many graces to all who wear it. Read the inspiring story of the converson of Alphonse Ratisbonne. For a an entire book on the subject see The conversion of Marie-Alphonse Ratisbonne by Bussieres, Theodore de, Baron. Read more about the Miraculous Medal at the Central Association of the Miraculous Medal and obtain a free Miraculous Medal. Learn more about the meaning of the medal at EWTN. St. Maximinus, abbot of Lerins, in succession to St. Honoratus, was remarkable not only for the spirit of recollection, fervor, and piety familiar to him from very childhood, but still more for the gentleness and kindliness with which he governed the monastery which at that time contained many religious, and was famous for the learning and piety of its brethren. Exhibiting in his own person an example of the most sterling virtues, his exhortations could not fail to prove all-persuasive: loving all his religious, whom it was his delight to consider as one family, he established amongst them that sweet concord, union, and holy emulation for well-doing which render the exercise of authority needless, and makes submission a pleasure. The clergy and people of Frejus, moved by such a shining example, elected Maximus for their bishop, but he took to flight; subsequently, be was compelled, however, to accept the see of Riez, where he practised virtue in all gentleness, and died in 460, regretted as the best of fathers. Read more about St. Maximinus in The Lives of the Fathers, Martyrs, and Other Principal Saints by Alban Butler. Read another short biography of St. Maximinus at the Lives of the Saints.